The lesson of missed opportunity resounds in this discussion of Xerox Parc and the Alto. They invented the PC and gave it away for free. In Australia, they are taking an initiative to get more math and science graduates into primary teaching -- those who do so will have a 50% refund on their loan payments. This in response to a study in July from the National Numeracy Review that "concluded that systematic teaching of numeracy in the early years of schooling, in maths lessons and across the wider curriculum, was essential if these trends were to be reversed." I find this interesting and hope that it will encourage people who love math and science AND STUDENTS will accept. Just a geek doesn't mean you love students or want to teach them. Sue H, a secondary teacher, highly recommends this as the research tool she uses in her classroom. If we're going to embed MLA into our wikis, we may test this out. Anyone else used it? SD Sherry and the conversation about a child who committed suicide at her school. When Will people start listening to teachers? We don't know everything but we often have insights into children's lives. WHEN? WHEN? Heartbroken for sensless tradgedy. I agree with Jeff Utecht that Kim Cofino is on to something with the collaboration cycle of "building indpendence through partnership" in terms of mentoring and helping teachers with their pd and technology integration. Linked in has added a pretty cool little discussion tool to their groups. We welcome the edubloggers on Linked in to join the edubloggers group over there. This is from the discussion board. "One month into my web2.0 expedition, I can see a whole new educational world opening. Work no longer seems like work as I find ideas and stories that inspire me and real people who know and share. Web2.0 is a place to reflect, retract, repeat and research. Still no real idea what I’m doing yet, but it is a safe place for learning. Makes you focus on what’s important. My brain still hurts, just differently. Paradox? web2.0 order vs a chaotic mind. Just lost focus, again." I think we'll all be hearing more from Tony. How did he get started, he says "I decided I'd make web2.0 a personal PD project." Tony, that is how so many of us, myself included joined in the revolution. Was visiting Tony Searl's blog and a post of his pulled into some great writing from down under educator and conference presenter Lauren O'Grady (laurenogrady on twitter). "We need to stop creating buzzwords such as elearning and eteaching as they are no longer relevant in our schools. Computers and technology have been around long enough. We need to move beyond this speciality paradigm and move into powerful learning and teaching. I see a real danger in the titles such as elearning integrator and epotential. Whilst we still continue to view ourselves as a speciality with specific skills we will never have integration into our classrooms where it is needed to benefit students. I was one of these people butting my head against the wall two years ago trying to understand why people did not integrate technology, I had to change my tact and look at it from a student perspective. I ran student roundtables and asked them what they would like in regards to powerful learning ( I never mentioned eteaching or elearning) and our students wrote about how they learn best. They wrote about the use of images, multimedia, web and how they can get answers but do not know how to distill or make sense of this information overload. There was also a huge push for content creation instead of passive dictation and exercises. These students never mentioned that they wanted more elearning in their classrooms and the teachers couldn’t help but rub it in when it wasn’t mentioned." I don't like the buzzwords either -- of course, I'm guilty of making up new works (teacherpreneur comes to mind) but when the buzzwords hide what we're trying to do. I think elearning is comfortable b/c it has been around a while and people feel less threatened -- it is like 'OK, lets do elearning and webquests' - they've heard it a while and are OK with that! The tough thing with some words like wiki and blog is that we need them to talk about a thing - about what we are doing -- and I use them so much that they are not a buzzword to me. To me, something becomes a buzzword when the "powers at be" start rubber stamping grant requests and proposals that include the "word." And that is what has happened with elearning at least over here! I think it is so important to get at what we are actually doing! I LOVE what you say about not letting buzzwords shift the focus of meeting the needs of EVERY student. The focus is on teaching -- not blogs, wikis, podcasts, etc. It is teaching. It is the students - every single one of them. And creating an environment that focuses on their learning styles, gives opportunities for assessment that allows a fair range of assessment options to that students can communicate in the way they do best. And projects that add meaning and give deep learning opportunities. These are the things that make great learning -- who cares if the e is on there or not. I doubt anyone watching my class would call it "elearning" hopefully, just learning!" What a powerful thing she did to have student roundtables (here in the US, we've had focus groups.) Let me ask you a question that I'd really like to know the answer to -- how many of your school improvement teams have had student roundtables where they were allowed to freely talk about how they learn? Wikispaces has released the ref tag, so now wikis, in addition to hyperlinking, may include references. We're still working through our class standards, and I"ve got a page on our school wiki that I will update for the students. We would love some feedback from the experts out there because some of these items are our best interpretation of wiki-fying MLA. We integrated this into some of our current projects today. Note: These projects are still not quite done. Return to your wiki page. Insert your blinker just after the quotation or paraphrase that needs a citation. Paste the reference into the wiki. Type the page number and a period after it if it is a book. If it is a website, turn the hyperlink into a "true" hyperlink as shown in the graphic by copying the hyperlink, clicking the link button, and pasting the hyperlink into the external link box. If this is the first reference on this page, go to the bottom of the page and type the word "References." DO NOT PUT A LINE UNDERNEATH IT! So, this is our first stab. Please leave your feedback and thoughts. I'll modify this blog post in the future if we see that these need correction. Thank you for your help! Some of you may wonder why this is the same time as Chris Lehman's amazing work at Educon 2.1 in Philadelphia -- the first reason is that we have a stellar speaker who has tentatively planned to come to Qatar and this is the only time he could do it, and secondly, we hope to network the two at some point if it works out. Additionally, this conference will be very international, pulling heavily from participants in past projects, and I don't know that the audience will have a lot of overlap. Educon is great, and this conference will have a different format from what he is doing. August 29, 2008 - Doha, Qatar - Flat Classroom Project co-founders Julie Lindsay and Vicki Davis in conjunction with Qatar Academy and the International Society for Technology in Education (ISTE) announce the first Flat Classroom Leadership Workshop and Student Summit to be held January 24-26, 2009 at Qatar Academy in Doha. This event is targeted to teachers and students of past, current and future 'flat classroom' collaborations as well as Information Technology teachers and Directors and school administrators who are responsible for pedagogical development with ICT in their schools. Two strands: 'Leadership Workshop' and 'Student Summit' will meet separately and in combined sessions to discuss best practice and promote global collaborative leadership as part of a global flat classroom. Participants will be given the opportunity to develop leadership skills in using information technology, particularly Web 2.0 tools, to connect, communicate and collaborate. To provide an opportunity for participants and supporters of the Flat Classroom Project and it's sister, the High School Horizon Project to have an educational and cultural exchange via an organized gathering. 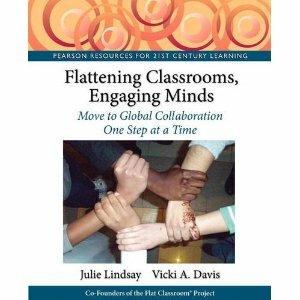 To promote connection and understanding between geographically dispersed ethnically and culturally diverse groups of students in meaningful, global cooperative authentic learning experiences. To focus on enhancing digital citizenship and fostering best practice methods for online learning in ways that can be shared synchronously and asynchronously with other schools around the world. To provide further opportunity for pedagogical development using emerging ICT and creation tools in differing modes. To promote leadership skills for 21st century learning amongst participants of all ages with an increasing leadership role for students in education practice. To advance our approach to the next stage in the establishment of educationally viable and valued global classroom(s) and all this means for relationship building and the development of independent and cultural learning for teachers and students. The conference format will be plenary sessions with keynotes and 'flat classroom' opportunities as well as summit and leadership strands with round table discussions, hands-on workshops, and panel discussions. Students internationally and locally will come together in Qatar with the purpose of learning more about how to connect, communicate, collaborate and create using Web 2.0 tools. They will be encouraged to foster interactions and to use the power of the 'flat world' to take action and make a difference to the world through enhanced cultural understanding. It is expected the skills and friendships developed at the summit will be taken back to their own schools and countries and further interactions and actions planned for the future. A number of scholarships for students and accompanying teachers are available. Our aim is to encourage participants from around the world to attend and wish to support this by providing funds to cover registration and accommodation. Students and teachers who have been past or current participants in the Flat Classroom Project will be given priority however we strongly encourage all interested applicants. We invite teachers to apply on behalf of their students. Up to 4 students will be considered for sponsorship from each school. Applications must be submitted by October 12, 2008. It is recommended that international participants arrive on the Friday. Scholarships for students available but applications must be submitted by October 12, 2008. Rooms have been reserved for January 23, 24, 25 and 26 as needed by conference participants. Hotel reservations (to get this corporate rate) are to be made through Qatar Academy. Registrants are requested to complete the online form to register and reserve a place at the conference and to reserve a hotel room. Payment details to be confirmed in October. OK, so now we can create references on the wiki! This is going to be one I'm going to DO this year! How to share your comments from Ann Oro in New Jersey. Also, I'm switching to Disqus sort of halfway - and soon the entire way so my comment links will stop working until I update. I'm loving Disqus for a variety of reasons that I'll have to blog. Person who wants to talk about learning intelligences for the 21st century -- see Jackie Gerstein's goals and join in the discussion. Feel free to join the Ning. Congratulations to my friend Eric Marcos for being featured in the Harvard Graduate School of Education "Everyday Heroes" column. Eric's Mathtrain.tv project is amazing and an excellent use of digital storytelling in Math. He is a fellow Google Certified Teacher and I'm so proud of him! Way to go Eric! Fascinating response from Chris Lehman to a Dan Meyer who asks him a question about what he should do when the test scores of his students don't measure up? In true Practical Theory style, Chris gives a whiz of an answer. Just turned up this very nice post by Doug Belshaw about Acceptable Use Policies that Include Cell phones - this one and the one he wrote before it are very nice talking points for your committe who looks at AUP's. OH, my heart goes out to Brian Crosby. To work so hard and have 10 laptops stolen! But amazingly enough, Brian even turns this into a learning experience. Brian is such a great teacher and a great person. These are very real challenges of any laptop program with some schools having more problems than others. I was reading your profile in Classroom 2.0. I am also a technology teacher but at the K-6 level. I'm always curious to hear what other technology people are doing. I wanted to share with you a program that my students and I were involved with since 2001 when we followed the voyage of skipper/teacher Rich Wilson as he sailed to break world records. It was a really exciting experience to have a teacher at sea to connect us with the science, history, math, technology and fitness. Rich is sailling again in 2008. He will be the only US sailor in the Vendee Globe and will compete with the top sailors in the world. He will once again invite students to follow along on his race with his website. I enjoyed it so much over the years that I share the site with as many people as I can. The more followers, the more fun exciting it gets for the students cheering him on. If you know of anyone who might be interested in sharing in on this adventure, I'd appreciate it if you would share the link. Rich did a webcast a few weeks ago with Steve Hargadon in Classroom 2.0 if you'd like to hear more about the program. "...This year, Skipper Rich Wilson, a former math teacher in the Boston area, will be sharing the race with students and teachers around the world by blogging, sending video clips, podcasts, and photos of the race as he sails. A team of experts will be on land to answer student's questions..."
Here is the interview with Steve Hargadon from Classroom 2.0. This sounds like an exciting thing for the students to do as well as to learn from this teacher at sea in many subject areas. This is a GREAT way for elementary teachers (and older) to flatten their classroom and engage in discussions about so many topics! I love this because it shows that through the Internet, we can all be a teacher anywhere we go. You can retire and do something exciting, create a website and still teach kids all over the world! This is also great because Lorraine is using her network through Classroom 2.0 and many of us are finding out about this project through her efforts. I think the best projects are spread at the grassroots level. So, take the torch from Lorraine and share about this. week, with 20 participating colleges and universities nationwide." I just thought this was funny - trapster lets you find where the speed traps, cameras, etc. are. Jott now has a link service to trapster to let you tell it where there are traps using your voice (that's handsfree for those of you who will use a ticket). Just think it is interesting to see the proliferation of tools. As for Jott charging - I forked over the $3.95 a month - I just can't live without Jott, and they've added new functionality to boot. Intel's inspire website for teachers. You can submit a video or story about what inspires you. I want to go through this and take a look at some of the videos. How are you using this website? He glides, he floats, he makes it look so easy. Fred Astaire just makes me relax and be happy when I watch this beautiful scene. But, Fred Astaire and great teachers have some things in common. Did it really take that long to get ready for this scene? It looks effortless and easy! Does it really take that long to plan for that lesson? It looks like they are just "winging it" and going with the flow? Yes. It takes a long time. Lots of knowhow, experience and practice. It is easy to see that Fred Astaire knew how to dance. He knew it inside and out. Great teachers do too. Fred Astaire loved dance like a great teacher loves teaching. It is in their blood, life, and bones. To stop dancing (or teaching) would mean that life was over. It is what we're born to do. Of course, there were four separate rooms for this scene and some camera trickery as well. Likewise, good teachers know shortcuts and tricks to make things work. They know how to silence a student goofing off with a raised eyebrow or can warm up the sad child with a gleaming eye. Fred Astaire had such a long and illustrious career because he never stopped innovating. He never stopped dancing. He tried new things. He pushed the envelope. Likewise, great teachers like Louise Maine and Ernie Easter, reinvent themselves. They push, they do more. They never settle. I want to be like them. So, today as you dance around your classroom, do a little two step. Dance a little lighter. You are the Fred Astaire of your classroom. Dance (and teach) like you mean it! You've got the most noble calling on earth -- live like it! Last season of Nova science available for download free from PBS - get it now. It is legal! They are doing it for teachers! Free quizzes at Proprofs - I've blogged about their flash cards before. Like the facelift for the site! Another Great blog post from Elizabeth Helfant from Mary Institute County Day School in St. Louis, Missouri, USA. This one distills the Student NETS into 4 ponts: 1) Inquiry, Research, and Information Literacy, 2) Digital Citizenship and Personal Learning Networks, 3) Communication and Collaboration in a Global World, and 4) Creativity, Inventive and Critical Thinking, Design. Her school has used these four talking points to give them two goals at school - managing information effectively and creating learning networks. If you're working with Professional Development and technology integration, Elizabeth has a lot of great things to share. She is so impressive! Whither censorship? « What Counts! Very interesting ponderings from an elementary teacher in Saskatoon, Saskatchewan, Canada about the balance and issues that have caused some parents to want to block all "social" tools in school. I think she has very balanced ponderings on this and it is excellent reading. Interesting article about childhood independence, going out to play, and the way we've started treating today's kids. Maybe they are ADHD because they are inside all the time! ;-) Who knows - I just know that the kids I teach who get out consistently are different - more creative, happier, more settled. This is a copy of the post I shared at the Supercool Blog This weekend. Because it was a live event, I waited a few days to post it here. I always enjoy reading the articles that talk about what kind of students that we need to create for our future, and I feel strongly that this is where I head in my own classroom. However, as I talk to many friends in education, they feel that they are educating industrial age workers, largely because the system is itself a product of the industrial age. her academic, leadership, and life skills, as well as potential." Unfortunately I cannot read the rest of the article (hidden behind a subscription wall), however, I've been turning over some very thoughts related to this subject lately and would like to use this opportunity to share them. Excellence is assumed. Everything we do should be aiming for excellence. Every school and teacher has its excuses. Good teachers don't make excuses, they overcome them. We all have our trials, but a commitment to excellence and drive to succeed no matter what is a prime ingredient in excellent teaching and excellent classrooms. Teaching is toxic, but the best teachers turn it into a joy. Excellence doesn't settle but finds a way to achieve anyway. Excellence, quite simply, overcomes excuses. I don't believe that technology is correlated with high achievement, any more than rubbing Einstein's head would have made someone smarter. However, a common denominator of successful schools is that they have technology and are EMPOWERING. They give their teachers flexibility but they also hold them accountable. I had a long talk with a fellow teacher in a large local public school system. She has two planning periods. One period is "team planning" with four other teachers about how they work through individual issues with the 140 kids that they "share." She says she really needs this time. The other planning period is "team planning" with the math department. They all have to stay together so that they can keep the standards together. She can't move ahead. She's not allowed to enrich or add anything. And every Friday, an "official test" graded by the "officials" comes down to her to assess how she's doing her job. She's fine, her kids ace it. Another teacher across the hall doesn't do well at all. (And of course, the students will be punished!) She usually finishes her weekly tasks by Wednesday but isn't able to fill up the extra time with enriching activities. And yet, she says that she could do so much MORE. And that is what standards do, they often pull up the lower performers but they can suppress the higher performers if poorly implemented. Instead of hiring and requiring people to be great teachers and empowering and expecting them to do their job, we are trying to make mediocre teachers better and keep the great ones from upsetting the applecart and "going to fast" and making the others look bad. Tell the teachers what the students need to know by when and let them get there in a way customized to the students in the classroom. No two classrooms are alike. No two students are alike. Welcome and encourage enrichment. And when a teacher is a poor teacher, it should be dealt with. Every staff has their "duds" - the teachers that everyone knows don't teach. And yet, these teachers are allowed to stay in the classroom for a variety of reasons. Sometimes they are a coach, sometimes they are related to the "right person." Accountability should be applied equally and not meeting the standards of excellence should have consequences for not only students, but teachers. So many teachers have no time alone in their own rooms. My friend with the two planning periods, has other classes meeting in her room. If she finishes planning early, she cannot go back to her room. So, she can come in before school (and she does) and stay well into the night to get things in order. Good teachers need some time to think, organize, get their rooms in order, and get things done. When is she going to get things done? I just don't understand it. This is a challenge for me as well as my room is usually bursting at the seams! Where there is no vision the people perish, says a proverb. So many feel like hamsters on a wheel. Do the same thing every year, don't change, don't improve, be here. I think that many teachers are as disillusioned. Recently, a local school system here spent a small fortune to bring in a motivational speaker for teacher preplanning. The teachers were brought in, shown a fashion show about how to dress, and then berated for several hours for being unprofessional. The teachers were upset and the debacle ended up in the local newspaper. Motivational is when someone actually listens to your problem AND DOES SOMETHING TO HELP! Most teachers are idealists. We teach because we believe in what we're doing. Believing that we are shaping the very future of our country and world, we want to do our best by these children of the future. So, when we see something broken, WE WANT TO FIX IT RIGHT THEN. The nature of teachers is to fix the boo boo, wipe the tear, listen to the teenager's gripe. When we come up against hopeless situations that are irreparably broken and some consultants or business people in a room who have no clue about education try to think of another idea to "fix" the problem that they do not understand nor know how to fix, we get frustrated. We can lose hope. If someone would ask and involve teachers. Now, there is a fine line. There are many teachers who see only the classroom, the micro view, and cannot see the macro view. And yet, there are many teachers who do see the macro view and could help and advise situations. Teachers cannot do it alone, but efforts to reform education sans the classroom teacher WILL fail. In a society that needs creativity, innovation, and common sense more than ever -- why are our school places of routine, standards, and senseless bureaucracy. I know teachers that spend an hour of time filling out forms for every hour of class time. When do they plan? What are most of the forms? A nothing piece of paper that no one reads! I'm sorry, but the volume of paperwork in most American public schools is asinine. Let bureaucrats come in and fill out the paperwork and let the teachers teach. Empower teachers to create projects and engage students. This is where the teacherpreneurship really comes in. Let teachers connect, give them the tools that they choose. Teachers and their students are individuals. We are as different inside our heads as we are on the outside. To require a standard lesson plan that is one size fits all is just not the right thing to do. Differentiated instruction and learning styles teach us that this is not true. So, we need to be able to customize the classroom. It is so wearisome to hear all of the buzzwords. I came from the business world and often business people think that they have education all "solved." I can tell you that I didn't understand ANYTHING about the classroom until I entered one. I didn't understand teenagers, puberty, kids, or even parents until I had a few years under my belt and there are still a lot of things I don't understand. If we improve every individual classroom in America, American education will improve. Adding bureaucracy and diplomacy on top of the struggling teacher will only continue to drive the hope, innovation, and individuality out of our schools that we so desperately need. It is obvious that we can produce athletes, a well rounded person is important. But now we need more. The definition of insanity is to keep doing the same thing and expect different results. Right now, I don't see anything really changing except in the pockets where administrators have inspired vision and teacherpreneurship in their teachers. So, I throw down the gauntlet. Stop reducing headcount and start reducing paperwork. Require bureaucrats to spend time in the classroom and let THEM record their observations. The teacher writing down what they are doing ISN'T an observation. Use webcams or podcasts to stream out of the classroom what is happening -- observe and let the teachers teach. There is no excuse for having teachers WRITE down how they are accommodating a student when you could literally record with a webcam everything that happens with that student in class. The teacher's view is just that - the teacher's view. Let curriculum directors and teachers decide what gets through the filter. Give them rights to unblock the tools that they need to teach. Move towards a model of embedded professional development. Binge professional development that happens in one day rarely creates sustainable, system wide change. Move toward embedded programs like the 23 things that involve teachers in their own pd and requires them to research, reflect, and use the tools. Put technology that teachers use on the top priority list. If they cannot print, fix it. If their computer doesn't work, get them a new one. Does the vice principal really need a new computer every year? Realize that not every teacher doesn't want or need to use technology all the time. Stop paying for gurus to "travel" on site and link them in virtually. Find and empower local "gurus" that you have right on your campus. Consider letting students create teacher PD as part of their technology education program. Provide technology integrators to work with teachers and projects in the classroom on an ongoing basis. Mentoring through a project the first time is often what many teachers need. Be careful about all edicts. Respect the individuality of teachers, but expect them to teach and do a good job. When they don't do a good job, remove them. Boards of Education need to hire administrators and empower them to hire and fire. Too much political turmoil is BAD for education if it keeps teachers from teaching and administrators from doing the right thing. Put in a little preventative education by putting digital citizenship components at every grade level. Educate students on the proper use of their tools and on what it means to be a professional student. Put in digital citizenship behavior codes in addition (or as part of) honor codes. Students should respect the privacy of other students and should not have the right to film or transmit the image of another without their permission. Students who do so, should be disciplined. The enemy is the behavior, not the tool. It is time to teach people how to behave and to teach students that online behavior has offline consequences. Understand that cell phones are part of the Internet and part of digital citizenship. Move away from ethnocentric viewpoints. Yes, this article has been driven at American education, but not because it is the only education, it is the only educational system with which I have any authority to speak. I've done a lot of work with schools of all types here in the US and this is what I've seen here. I've seen my students have their world view blown wide open when they see how incredibly competent students are in other countries. When they realize that competent people live all over the world, their viewpoint changes. An entitlement mentality is a ticket to the poorhouse for any nation. Understanding that working hard and doing one's best is essential for success in today's society. Put art and drama back into schools. We have a whole brain -- we are creative and logical, we are artistic and textual -- we need all aspects of life to be included. Sometimes if a student can have ONE class that they LOVE, it helps them tolerate the things they don't love. People aren't going to go into fields that they are poor at and hate, but things they are good at. So, we need choices! Let them paint AND do math. Let them act, run, dance, and read! They are a whole person, it is time to treat them that way. I think kids are quitting school because there is nothing there they even enjoy. Integrate digital storytelling at every grade level in all subjects. And I'd like to ask you, if you were able to be brutally honest, what would your gauntlet be? What gauntlet would you throw down to improve education? Photo license purchased from istockphoto, you do not have permission to copy or reprint this photo. A website for creative commons music. Searching for places to send my students to get music. The big problem is that there is no guarantee there won't be profanity in the music. We really need to do something about this! This is the location for getting the Mango game that Lorraine Leo recommends so highly. Mango looks like a really cool game to play on those Kindergarten smartboards. There are a lot of free interactive reading games to use with your interactive whiteboard. Pass this along to your elementary teachers! Sound effects and music for free - but your work must be creative commons and you must share it! This program comes highly recommended. Only the pay version lets you save music, but you can play with this flash interface to see how it works for mixing music - recommended for middle and elementary PC users. Friendfeed scripts for those who love the service (I"m not as much up on it as some) but it integrates twitter and linked in information. For those who like to hack their connections. Let me ask you this, will your last year's graduating seniors have enough web savvy to know how to set this up online? Is it because of anything you taught them? Mashable's overview of accounting and budgeting software. Fascinating game for elementary students called Mango from Lorraine Leo on Classroom 2.0. She is doing fascinating work. This is a site built by Jackie Gerstein from Arizona. She told me "I began developing a website to showcase different Web 2.0 tools that students can use. I provided some examples but plan to have my upper elementary students add to it as we explore and use other tools." She built this using synthasite and it is a great thing to show elementary teachers to showcase some of the best tools out there. Great job, Jackie! Enjoyed this page demonstrating a tool I hadn't seen called Moblyng. Who is using this tool? Mix up faces at Make Me Babies.com - good for a sense of humor. Another must read motivational post for those in leadership from Doug Johnson. I love the part where he says this time of year he needs to wear iron underwear b/c everyone seems to want to take a bite out of his a*%! Criticism is so tough to deal with, especially when you feel a lone. This is something I've been taking on the chin lately at our school and sometimes it really makes me want to quit. I think it is because as connected as I am with all of these amazing educators, right now in terms of technology, I don't feel very connected with the teachers at our school, largely because my workload barely gives me time to go to the ladies room! Image enhancement and how it works, good resource for photographers. Funny article on the 15 worst teachers in the movies - as a follow up to the 15 most inspiring. 15 most inspiring teachers in films -- enjoyed this list and see a few I want to see. Cool tricks and such that you can use in the classroom. Share yours here. Interesting - -solar ovens made out of pringle cans. This service comes highly recommended from people around the world and is a grassroots effort of people sharing the electronic devices that they need to recycle and posting them in the group local to their area. Here is the letter I sent, will you share yours if you send it. If we make it easy for others to copy and paste, maybe we'll get more support for this. "If you don't want to do an article on this -- could you include this as a letter to the editor. You can contact me at **********. I just wanted to point out that there is a group online called "freecycle" - http://groups.yahoo.com/group/pelhamcamillafreecycle/ - and that we have a group for Mitchell County. So many people are throwing away their old computer and electronic equipment into our landfill and do not realize that it will poison our very future. DO NOT THROW monitors, electronics, or computers into a landfill - ever! Heavy metals and all sorts of things are in this equipment and it doesn't break down. The Camilla Chamber had an incredible opportunity last year for computer recycling and I hope they will do it this year. As much as I love technology, I love this land and our people so much more and it pains me to know what we are doing to our future water supply with such toxic materials being dumped into our landfill. I ask all of our city and county officials to pass policies promoting the effective, free disposal of electronic equipment for the citizens of Mitchell county. If you want to receive old electronic equipment that is usable, log onto the Freecycle network. - http://www.freecycle.org/ This is a grassroots effort of people who use technology and are concerned with how electronics are being thrown in the trash! What will you do? Have you signed up for Freecycle? Another "safe" world -- has anyone tested this one? It has a lot of seals and awards. How to get and set reminders on twitter using the user "timer." Tips from Life hacker on how to use Remember the MIlk with Twitter. If I don't renew Jott, I may have to just brush up on the twitter interface for RTM. This site was founded by one of the cofounders of the original Powerschool. It lets you play multiple things and mash up a presentation. This looks like it has fascinating applications. Glubble is a firefox plug in to allow you to sort of monitor/ filter what they view online without having to pay for a filter. Yes, it is a filter, but for elementary aged children, I think it could be a good idea. Would love to hear a review from a reader. the Best Buy Teach Awards are a great grant for technology intensive classrooms in the US. The applications must be submitted by October, 12, 2008. Free Standards Toolbox for State Standards and also a lot of teacher tools. This may be something for those who are working with standards. It is free! A new website for kids that uses search and also some filtering. Another website to take a look at for kids. Not sure about the revenue model - will have to look. Another place to make websites in an easy way. This has no ads on your website, a must for educators. Anyone test this one? Another new website to help students study. It says that it helps students get organize and overcome procrastination! MIght be worth the trial to learn their tricks! ;-) They have a 14 day trial. K-12 Open Minds Conference | Open Source. Open Technology. Open Content. Open Minds. K12 open minds conference about open source software and its use in education to be held in Indianapolis in late September. Great opportunity. Oh, what a disturbing message. What if Google held our gmails for ransom? How much would you pay? Would it be right? This is the case with all of the things we have. Recent changes at Jott and Twitter should make us think! In fact, I couldn't even blog about it if it happened to me! Website which will send you free books and asks the school and library professionals to rate the children's books. This is a great opportunity for those who are strapped for cash. A reader named Liesl send in this great article from LifeHacker about the alternatives to Jott. Actually, after reading this, there really isn't an alternative to Jott without a lot of elbow grease. I may be coughing up the $3.95 a month. I just really use it. However, I'm going to email them. I NEED A FAMILY PLAN! I have my children using Jott on their cell phones but they use it very infrequently. I should be able to have some sort of family plan for our situation. New World Notes: Generation Why: Is The Second Life Experience Fundamentally Gen X-Centric? Discussion of why Generation X is inundating Second Life and why Gen Y is so underrepresented. I will say that my students LOVE Second Life, but you also have to remember that I teach students who, for the most part, grew up playing outside and have engaged in free play all of their lives. Perhaps this is also a function of the presence of free play in the lives of children. How many Gen Y kids truly had free play as part of their childhood? We've sort of structured and organized everything for them in many cases. A place where students can create things and share their inventions. I have an invent this project coming up and am going to look at the tools here. Another new tool for building websites - synthasite. Have any of you used this new tool? New website set to share information between preservice teachers. Interested to see this software. Hope to get a copy and see how it works with my students. I have no doubt that moving content to mobile devices is going to be an incredibly useful thing to be able to do in the coming years. Do it now or do it later? How about 1:1 cell phone schools instead of laptops. National PTA (the parents organization for public school parents in the US) has launched a webcast to communicate with parents. One thing this does do is legitimize the webcast for parents. You can say "Look parents, PTA is webcasting, it must not be evil." For the use of this tool, I applaud PTA. Article on picking the best camcorder for a Mac. Thought it was worth sharing. Beth's Blog: How Nonprofits Can Use Social Media: How Long Does It Take for 250 Super Connected Gnomedex Geeks to raise $2,500 for Cambodian kids? I'm proud of Beth Kanter and her recent work at Gnomedex in showing people the power of social media to help important causes. It was all over twitter this weekend. Way to go Beth! Organizations that organize these tools also ignore potential donations. A website for students to rate and research their colleges. Atomic learning has an assistive technology collection that they have just rolled out. Fifteen year old programmer, Kasra Kyanzadeh, from Canada, emailed me to tell her about this website. This is another one to review. I hope that you'll share if you've used this site and what you think. With so many easy options, we should all be able to find something that suits our needs (and/or our filter.) This one costs $20 CAD a year but you can have a 90 day free trial. From Leann Lacy - some cool materials to use with children for safety and other educational games. Some students have started this to promote environmentally sound actions. This is run by students and I saw a little profanity on the home page. Students interested in environmental issues, the forecast earth summit is open for applications. Twenty students will be flown to Washington DC, December 5-7. This is sponsored by the weather Channel. Do you know a student who would be a good eco ambassador? Website of a group of people collecting funny school stories for a book. 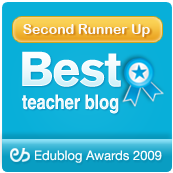 We need more parent edubloggers! Great way to test the waters w/ this tool. Free Office 2008 tutorial through September 10th, 2008, pass this along to teachers. 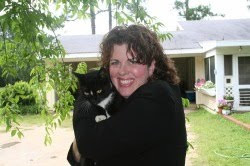 Jennifer Eubank's Class Blog. She is in Taylor County (just spent some time there) and is really on fire! She used a google form this week. There are so many great ways to use these tools and NO ONE has the monopoly. (No, not me either!) It is so important to keep looking at what teachers are doing and share what we think works and doesn't. I expect great things out of Jennifer! Article by Vicky Hennigan - an up and comer in the parent edublogger category about the use of twitter for missing children alerts. Don't know a lot about how this would work but think that perhaps there are applications for having public twitterboards for such things. Susan Silverman knows how to do elementary projects -- Her fall project is the Online Autumn Revival and includes Kindergarten, 1st grade and 2nd grade classes. This is a great one. Project that is connecting students and teachers of Spanish from around the World. There is still time! London Times article on their picks for education blogs. Inspiring story about a teacher who took back her school from crime. Inbox Zero Makes Me Feel Frisky!